After tackling the #@%$#%@ bassinet cover, I decided to do some smaller projects that would involve stash busting and actually trying out something from Pinterest. As you can imagine, I have a 'board' of items for Poppyseed. I thought I'd start small and try my hand at burp cloths. I have tons of fabric in increments under a yard - fat quarters that I liked or scraps from garments I've made, so I decided to start with that. I did have to pick up some 'absorbent' material for the base of the burp cloths, but generally everything else was already from my collection. 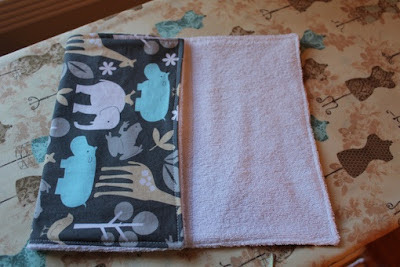 I found a few burp cloth tutorials, but I liked the version from Made the best. It was for burp cloth gift sets. 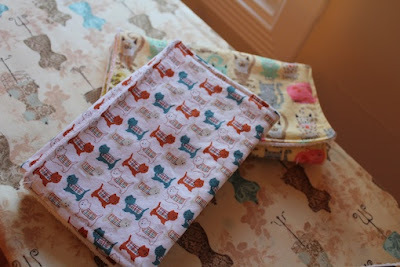 It was perfect for the fabrics that I had lying around and was so easy to do. This might become a go-to gift item for the future. Aside from the prep (mainly washing and pressing the fabrics), I got to the point where it only took about 10-15 minutes per cloth. More on the shorter side if I did them production-line style. I picked up a yard of terry cloth fabric, on sale at JoAnn's (again, using the rest of my Christmas gift card). I had four different prints and had enough terry cloth to make 8 burp cloths (2 in each print) and some washcloths with the leftovers. I cut the fabric into 10x18 pieces (approx, some where slightly smaller depending on what I had on hand). I smoothed them out, right sides together, with corresponding terry cloth pieces then pinned them in place. I then stitched them close to the edge, leaving an opening to flip them. After trimming the corners, I flipped the pieces, once again smoothing and pinning in place. I then top stitched the cloths, closing up the opening in the process. I also did as the tutorial recommended and stitched two lines through the cloth, to act as folding lines. Fold the burp cloth in thirds and voila! As I mentioned, I made 8 burp cloths - 2 in each pattern. I absolutely love how they turned out! 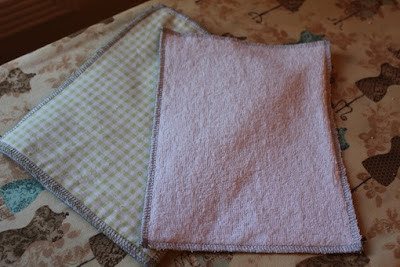 I also had a little extra terry cloth so I cut them into four pieces, about 10x6 each. I also had a tiny bit of leftover gingham from the bassinet cover so I cut it into corresponding pieces. I had exactly enough to make four washcloths. I just serged the edges and voila! All four took maybe 5 minutes to make. I'm loving these little crafts! I might try to make my own nursing cover next. I have my eyes on yet another tutorial from Pinterest. I think I have enough of a scrap fabric left, and I have some boning on hand... so we'll see! My back aches a little from working over the sewing table so much, but I think it may also be partially because I haven't been used to doing that in a while. 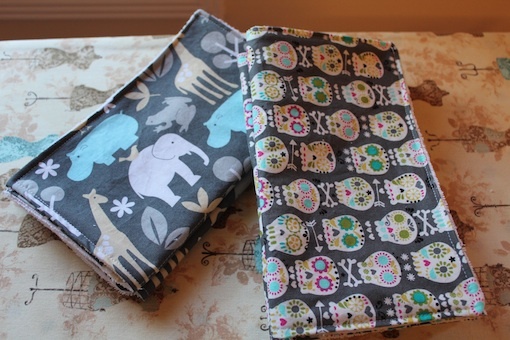 I actually wouldn't mind making more of the burp cloths, maybe next time with a softer fabric than the terry? But to be honest, I don't know how many you need and 8 seems like a good amount. We'll see - I might find some other tutorials for little projects for my shelf of scrap fabrics. Thanks for the tip! I will definitely make some more then. I almost bought some chenille yesterday but thought 'nah, 8 will be enough.' Now I know! And I definitely have tons of scrap fabric that can be put to use for these! I think I'll try to make some changing mats too. Thanks! Love your little baby makes - I just loved making these little bits and bobs while waiting for my daughters to arrive! !